Are you feeling burned out from your dull workouts? Are you looking to challenge your body, but hate the dreaded treadmill or dumbbells? Fret no more. The South end offers a variety of options to get your sweat on and all in close proximity to 88 Wareham! Today, Boston’s South End is a quintessential neighborhood, lined with brick sidewalks and brownstones. Better yet, it’s a community known for its thriving art scene and workout studios as well. Places that will help motivate you to move while rejuvenating your mind and body. Earlier this year Chronicle TV featured Swet Studio, a ground-breaking workout studio that offers anti-gravity aerial, yoga, barre, stretching, and even meditation classes. These unique classes are done in the air all while utilizing suspended silk hammocks attached to a purple cathedral ceiling, working your muscles in a totally new way. At Swet Studio, you’ll be so focused on mastering your aerial poses that you won’t even notice that you’re working your muscles in entirely new ways. Rumor also has it that you’ll feel like an acrobat. On the contrary, if you are looking for a slower paced class to decompress the spine, Ag Yoga Deep Stretch offers a relaxing class to ease your stress. Suspended in hammocks, proponents say their classes will relieve pressure on your spine and discs. After class, you can finish with “Levitation”, a practice which you will be nestled in your hammock with a guided meditation that will be sure to restore your spirit and vitality. Another option is Yoga Sculpt at Core Power, a workout that is anything but boring. Their intense workout combines upbeat music, free weights, and yoga, giving you results. Referred as a combination of hot yoga meets boot camp, Yoga Sculpt offers back and forth workouts, transiting between traditional vinyasa yoga, plyometrics, cardio, and strength training. The fun comes in when the instructor turns up the volume on the upbeat playlist to keep you motivated and moving. 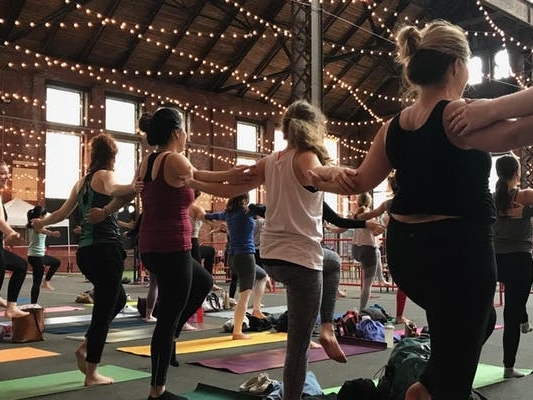 If you’re not looking for a mix of everything at Yoga Sculpt, every Sunday at SoWa’s Power Station is home to challenging workouts with an energizing playlist. Be sure to check out SoWa’s calendar as they host of a variety of classes that vary week to week. On the 30th of September, they are hosting Yoga, Art, and Sound from 10 am to 11 am, a combination of live art, live music and yoga creating an exceptional multi-sensory experience. After your sweat, stick around for Food trucks and a local brew at SoWa’s Beer Garden. 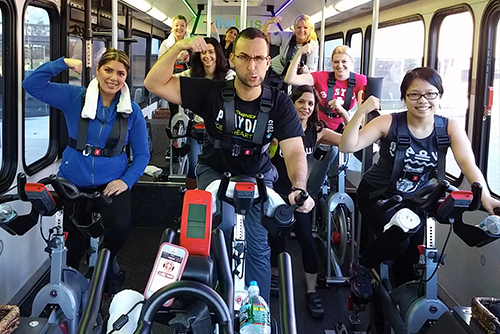 If you’re bored with your existing spin class, Bike Bus offers classes outside. As you spin, you’ll tour the city of Boston. They also offer indoor cycling class, with the cost including a towel service and a padded seat. If you have an out of town guest, Bike Bus is a great way to work out and show them the city. Better yet, they even accommodate groups as small as eight people if you’re looking for unique team building opportunities.